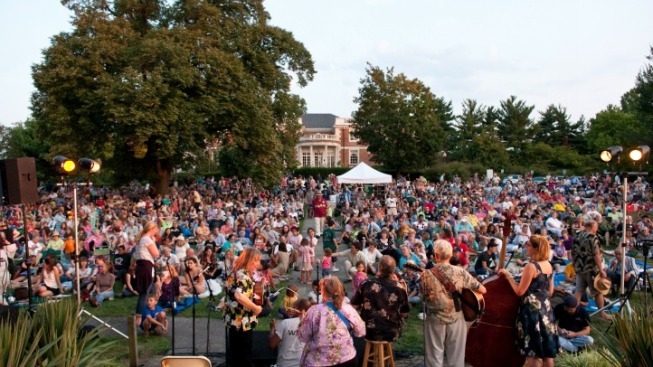 The Strathmore in North Bethesda will begin hosting its annual free summer outdoor concert series June 26. "It's a wonderful place for people to gather, bring a picnic and enjoy diverse types of music -- from go-go to Brazilian tropicalia,” said Strathmore Director of Programming Georgina Javor. This is something you don't see every day. These guys are a mix of traditional Colombian beats with a synthesizer -- think Shakira meets Daft Punk. Ukefest features jam sessions, concerts, music workshops, and hula and yoga classes. Lessons are extra (see details here), with an open mike set for 7 p.m. and a staff concert from 7:30 to 9 p.m.
"It's a participatory event -- the audience is encouraged to bring along their ukulele and strum along together... and then they see tremendous uke players from all over the country perform," Javor said. The event features the sounds of the ukulele (we know, you're shocked,) along with the Hawaiian steel guitar and the tenor guitar. Grammy winners (and Maryland locals) Cathy Fink and Marcy Marxer will host. Other performers include Hawaii's Hula Honeys, New York's Stu Fuchs, Wisconsin's Lil' Rev, and newcomer Gerald Ross on lap steel guitar. Prepare to get mellow. Ukefest usually attracts more than 2,000 people each year. Concerts will be held every Wednesday at 7 p.m. through Aug. 14 at the Gudelsky Concert Gazebo in front of Strathmore's Mansion. The venue is located across the street from the Grosvenor-Strathmore Metro Station. Parking is $5 in the Metro garage. If you go hungry, head to the BBQ Shack for food and drinks (see menu here). Strathmore is also partnering with Hungry for Music, an organization dedicated to providing young people with instruments. You can donate used instruments all summer long.